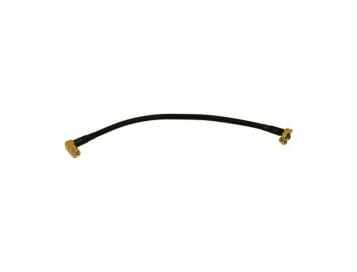 Replacement high quality Pigtail Cable RP-SMA to RP-SMA to connect the Ubiquiti Rocket to Sector Antenna's and Rocket Dishes as well as for use with MikroTik radios such as the RB912 Outdoor. After about two years of service, we have found that the original pigtails begin to deteriorate causing loss of signal quality, lowered radio modulation rates, lowered CCQ and poor AMQ or even complete link failure. So, we improved on the original design by getting these made to our own specification. Using a high quality UV stabilised black outer sheath double screened low loss coax (CLF-200) (unlike the poorer quality RG58 coax used by some manufacturers), solid brass 90 degree connectors instead of straight ones and making the cable longer, we think we have created a much better and easier to use version of the original pigtails.